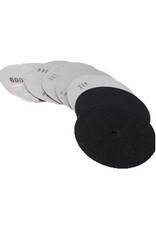 Alpha Sandpaper discs consist of a waterproof hook and loop backed material combined with a silicon carbide abrasive, the perfect combination for use on marbles and softer types of natural stone. 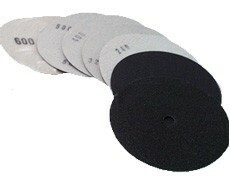 Sandpaper resists clogging when used wet, thus extending the life of the disc but discs can be used dry if necessary and are very durable. The hook and loop backing makes disc changes simple. Silicon Carbide is the abrasive of choice for sanding and polishing marble, travertine, terrazzo and onyx. Alpha Sandpaper can also be used to polish glass, metal and wood.